Sogod Bay, Philippines is a relatively unknown dive destination, and many of us would even have trouble locating it on the map. 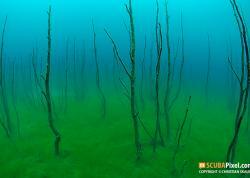 Those who do venture to Sogod Bay soon learn that the diving is incredible. History buffs and those with long memories would nod knowingly if you mention that Sogod Bay is in the south of Leyte Island (home of Palo Beach) and the place where General Douglas MacArthur strode up the beach in the reconquest of the Philippines from the Japanese in World War II. For an island with such historical significance and tourism potential, Leyte still remains something of an afterthought for travelers to the Philippines. A plausible reason for Sogod Bay's anonymity is that Padre Burgos, the main diving town and home of the dive resorts, is surprisingly hard to reach. There are at least 4 “direct” routes to Padre Burgos, each a travel combination of plane, boat and wheels. Ferries in the Philippines generally are much less reliable and prone to delays than flights, so flying presents the most reliable way to get there. There are currently three daily flights from Manila to the main airport on Leyte, Tacloban, with another two daily flights from Cebu. From the airport it is a three hour(!) car ride to Padre Burgos and I highly recommend undertaking this journey during the day, as it allows you to see the natural beauty of Leyte Island. The last hour or so is a nice coastal drive, allowing you to take a sneak peak at the waters that you will explore in due time. Another big joy noticed during the ride is that traffic is virtually non-existent, unlike during transfers to more accessible diving destinations near Manila or Cebu City. You soon notice a refreshing sobriety to the urban planning here as you get into the mindset for your dive vacation. Sunlit Fishbowl. Taken with 2 Sea & Sea YS110a at ISO 80. Manual mode at f7.1 and 1/160s. 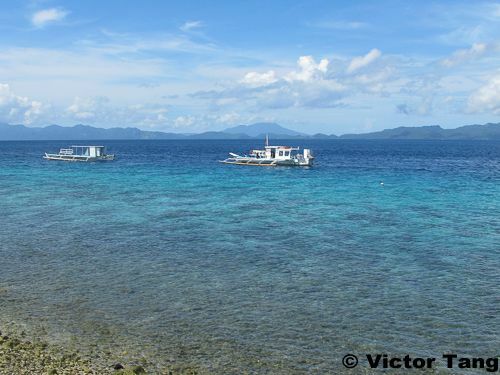 Scuba divers and photographers will find that Sogod Bay is a great destination for massive, plankton-feeding Whale Sharks, who swim in the waters near the bay’s entrance between November and April. As in Donsol, east of Manila, snorkeling trips are organized allow opportunities to swim with the whale sharks as they glide along their migratory route. Whale shark viewing trips do not come cheap, however, and sightings are not guaranteed. Also, those who have snorkeled with whale sharks know that trying to swim alongside them requires some real swimming fitness. Because the reefs around Sogod Bay also have a high likelihood of spotting a whale shark during a “regular” dive, I found that the best diving option was to book 3-tank boat dives instead of the snorkeling trips looking for whale sharks. Sogod Bay arguably has some of the most pristine reefs and superb macro sites in the Philippines – a photographer’s paradise. Napantao: Star of the show. Taken with 3 Sea & Sea YS110a at ISO 80. Manual mode at f8 and 1/1600s. Dyron 8mm Fisheye. There are 22 official dive sites in Sogod Bay, so there’s more diving than you could hope to explore on one trip. Average dive trips in Sogod Bay are 10 days, and the following is a selection of dive sites you should not miss. 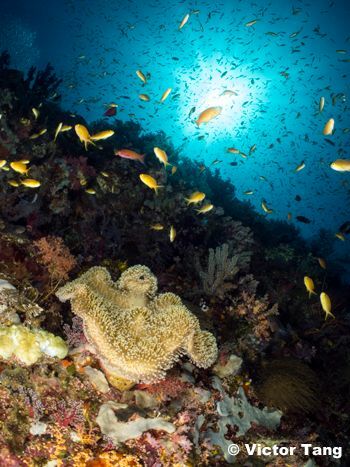 Located across the bay from Padre Burgos, Napantao Wall is a wall large enough to be split into northern and southern sections, requiring 2 dives to fully traverse. 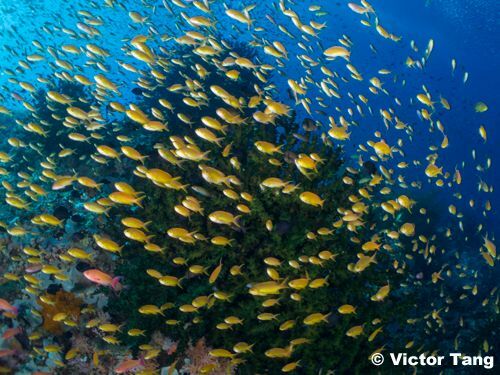 Napantao is the first designated Marine Protected Area (MPA) in the area, and once you descend it is easy to see why. 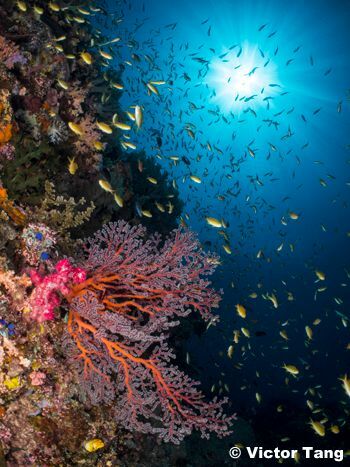 Dense schools of reef fish congregate around the wall down to the fifty-meter bottom, with armadas of purple and yellow anthias flitting in and out of huge gorgonian fans, and green branch corals jutting from the wall with pride. This is one place where watching the skittish anthias vanish into their coral hiding places is truly a sight to behold. Anthia wonderland. Taken with 2 Sea & Sea YS110a at ISO 80. Manual mode at f7.1 and 1/60s. 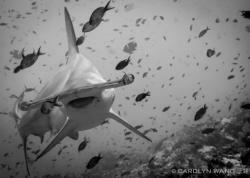 Once through the thick layer of reef fish, divers are presented with a rich hunting ground for macro subjects. 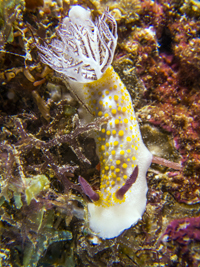 Napantao is fertile ground for spotting frogfishes and all types of nudibranchs, from the rare to the mundane. Pelagic fish and whale sharks do visit the wall so you do have to divide your attention between the wall and the open water – not a bad problem to have! Napantao presents a true dilemma for the underwater photographer as there are many wide angle and macro subjects, and multiple visits to the wall should be arranged if possible. 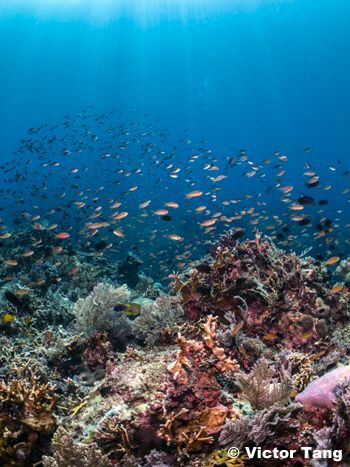 It can be confidently asserted that Napantao is a representative microcosm of the marine landscape that is fast disappearing from Philippine waters. Fish Everywhere!. Taken with 3 Sea & Sea YS110a at ISO 80. Manual mode at f8 and 1/000s. Situated just south of Padre Burgos, Santa Sofia is a gentle slope full of hard coral that descends down to a 25 meter sandy bottom. 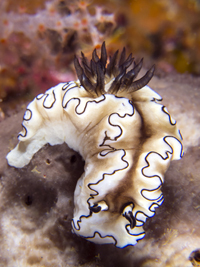 Again, this is a great place for macro with a large variety of nudibranchs, pygmy seahorses and ambush predators like the scorpion and crocodile fishes. Hawksbill turtles are known to patrol these waters and take a “breather” among the hard coral, so keep your eyes peeled for them. 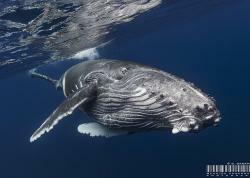 It is definitely possible to have a close-up encounter and photo session with these gentle creatures. Left Photo: Doriprismatica Atromarginata . Taken with 2 Sea & Sea YS110a at ISO 80. Manual mode at f8 and 1/250s. Dyron +7 dopter. 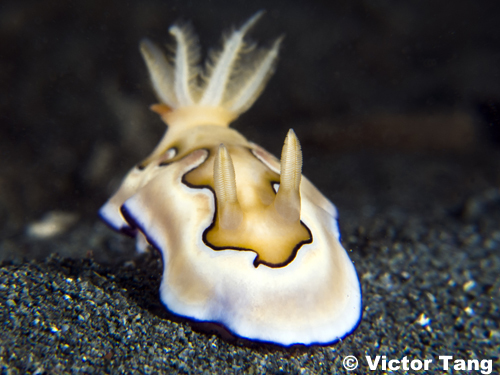 Right Photo: Taringer Halgerda . Taken with 2 Sea & Sea YS110a at ISO 80. Manual mode at f8 and 1/500s. Dyron +7 diopter. 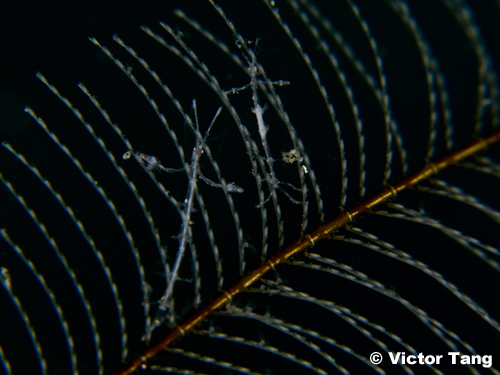 Skeleton Shrimps. Taken with 2 Sea & Sea YS110a at ISO 80. Manual mode at f8 and 1/500s. Dyron +7 and Subsee +10 Diopters.